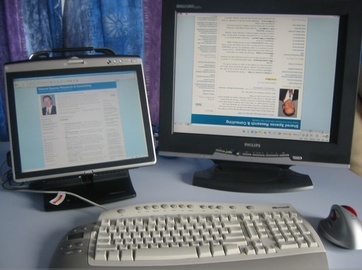 Air Display allows connecting your iPad or Android device to a Windows computer or Mac. It also allows the use of laptop as a wireless second monitor. MaxiVista is exclusive for use with iPads and Windows operating systems. REDFLY ScreenSlider is the cheapest right now and is meant for use with Android devices and computers running on Windows. Splashtop XDisplay allows remote access to a PC. The XDisplay and Splashtop Streamer apps, however, will let you use your iPad as a second monitor. To configure your PC, the basic steps include downloading the app to your app then to your PC. After running it in your computer, set up the permissions and allow firewall exceptions. Next, open the app in your device and choose the name of your computer. Adjust appropriately the screen size on your tablet. If you need further help, simply check out the site of the app’s manufacturer. Tablets now come in different sizes. Apple, of course, pioneered it with the iPad. It also released its iPad mini just last October while Google will release its Nexus 7 and 10 this month. Asus also released its Vivo Tab RT last week and Samsung is enjoying the popularity of its Galaxy Tab 2.